It’s been eleven years since Rev. Rob Banse made his way to Trinity Church and in that time, he has been my supportive supervisor, cheerful colleague, trusted pastor, and dear friend. I will miss him greatly. Rob’s steady temperament and calm demeanor were just what this congregation and staff needed after a very divisive period and difficult transition in the life of this church. His sincerity and integrity helped restore faith in the clergy for me, as I’m sure it did for many others. Since that time, I have had the privilege of working with Rob as he has pastored this community with great love and sensitivity. For eleven years he has baptized us, married and buried us, celebrated countless worship services, led bible studies and other spiritual programs, and counseled us all, including me personally, in times of sadness and joy. He has always been supportive and appreciative of music and served as frequent soloist for the 8:00 service. While we will all miss Rob’s loving presence in our lives, I know that he has made the decision to leave with the same deep thoughtfulness that he has given to all his work here and completely trust that he has made a wise choice. We will all look forward to celebrating his ministry over the coming months and wish him the very best in his next endeavors. In that spirit, we will do our best to continue God’s work here in Upperville as we begin yet another season of ministry at Trinity Church. We will kick things off with the annual Activities Fair on Sunday, Sept. 9, and various choir rehearsals will begin in the following weeks. I hope you might all take the opportunity to encourage people to join one of our choirs as we prepare to have our upcoming transition accompanied by music that is both beautiful and spiritually uplifting. One of my great joys at Trinity Church is working with our Church Music Interns. The program is designed to be one of mutual ministry, giving a music student the opportunity for practical, hands-on experience with our wonderful choirs while also sharing their unique gifts with the congregation and providing valuable assistance to me. Over the years we have been blessed with many wonderful and talented interns who have enriched our music and our lives in many ways as well as letting me feel like I have, in some small way, also offered them something of value. Our current Intern, Sarah Saul, has most ably continued that tradition. All, of our interns have had different gifts, but Sarah has been more out of the ordinary than most. Usually the interns are here for just one year, much of which is spent just learning the ropes. Having served in this position for two years, Sarah is easily able to read my mind and usually know what needs to be done before I do. While most of our interns come from a choral background, Sarah is a supremely gifted flutist with an orchestral background. Not only have we had the pleasure of her artistry on the flute, we have also benefited from her instrumental perspective. Due to Sarah’s instrumental training and skill, I gave her an opportunity that no previous intern has had. 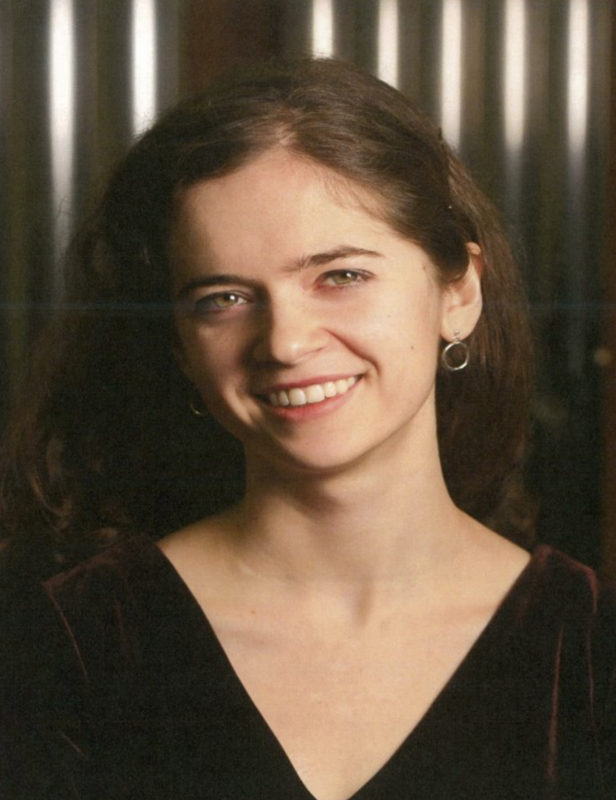 Last month, Sarah conducted the prelude for brass and organ on Easter Sunday. It has been exactly ten years since the first and only time I have used this wonderful piece of music and in the second part of this article I include what I wrote about it at the time. Sarah will be conducting her final anthem on Pentecost Sunday and then winding up her time here in June leaving us all a few weeks to thank her for her service and wish her well as she pursues a graduate degree in flute. In her time here, Sarah has touched the lives of many, both young and old, and been a dear friend and trusted colleague to me. And so, I offer to Sarah, Farmer Hogget’s words of highest praise on a job well done. “That’ll do pig, that’ll do”. A month or so ago I was reviewing pieces for brass quintet and organ to use for the Prelude on Easter Sunday when I found an arrangement of the Maestoso from the Organ Symphony by French Romantic composer Camille Saint-Saëns. It was everything I was looking for. It was the right length, used the instruments I had available, made a grand musical statement to set the tone for the service and expressed the triumph of Easter. There was only one problem. This very piece of music was used as the main theme for the children’s movie “Babe” and I wanted this first piece of music heard on Easter Day to create images of victory over death and not visions of a talking pig. I went back and forth on it for a few days soliciting opinions from a trusted few. I shared my dilemma with the rest of the church staff who assured me that very few people would make the connection. I felt more confident. Just before a children’s choir rehearsal I asked our music intern, Drew, about it and he agreed that no one would recognize it. I felt more confident still. Not ten minutes later, as the children were coming into the choir room, I was diddling on the piano a few bars of the main theme. Completely unsolicited, they immediately asked, isn’t that the song Farmer Hogget sings in “Babe”? So much for confidence. And so it was that I began the greatest celebration of the Christian year wondering if my choice of prelude music was a mistake. At 10:25 I gave the downbeat, a grand fortissimo C major chord in the organ followed by an introductory fanfare in the brass. Then came the moment of truth; Farmer Hogget’s theme. It is introduced by just the organ so softly that I felt sure I could hear a murmur in the congregation. As the piece went on to its triumphant conclusion and into the opening hymn, I hoped that it had conveyed the desired effect and that I had not turned Easter into a secular farce. Through the next bit of the service, I continued to privately fret about what the reaction to this music would be: And then came the sermon. The first words out of our beloved Rector’s mouth were “What’s the deal with the Easter Bunny”. My concern vanished instantly. First of all I now knew that anyone who had a problem with music used in a children’s movie would probably have a much bigger issue with a sermon about the Easter Bunny and forget all about my prelude; (Thanks, Rob). More importantly, I realized that this sermon was drawing everyone into the story of new life. A church brimful of people of all ages and backgrounds, some regulars and others who had not been here since Christmas, all found something familiar and accessible about this sermon introduction and then listened carefully to its real message of Jesus’ Resurrection. I can only hope that the same is true for a piece of music that has been played in the greatest of concert halls and churches for more than a century as well as accompanying a little pig who also triumphed over death. CMSP is delighted to announce that Jennifer Riddle has joined our faculty as a trumpet instructor. Jennifer received her Masters in Music, Trumpet Performance, in December 2017 from Shenandoah Conservatory. 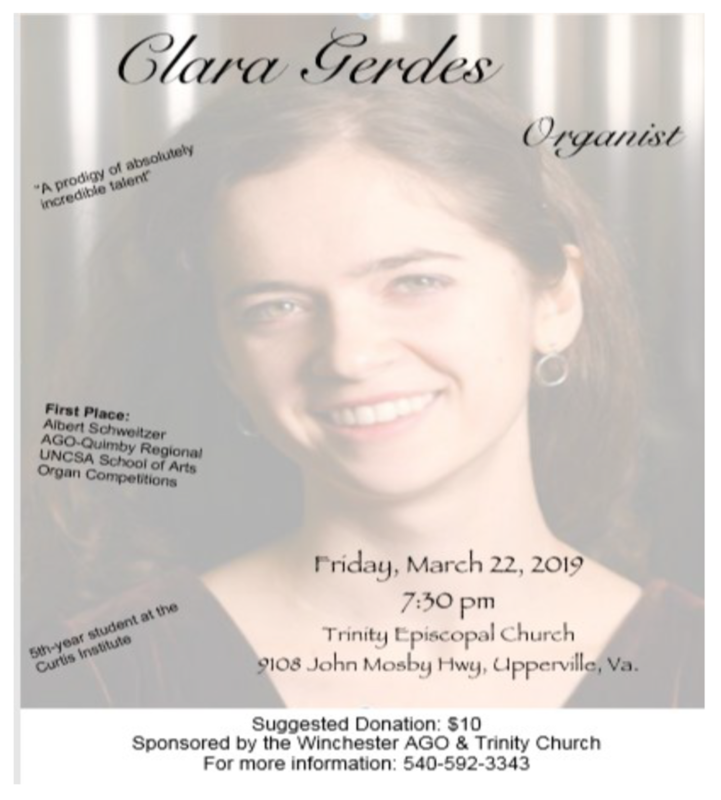 A graduate of Guilford College, she has performed with the National Concert Band of America where she is first trumpet, and has also played with the Shenandoah Conservatory Wind Ensemble, and the Mid-Atlantic Wind Symphony. She is a founding member of the Luminous Brass Quintet. For high school and college singers, Spring break often means going on a choir tour. I remember many years in my youth being jealous of my friends at the beach while I endured endless hours in a smelly bus, multitudes of meals of frozen lasagna in often smelly church basements, and restless nights on host family fold out sofas with, you guessed it, a smelly roommate. Mixed in there somewhere however, were many wonderful experiences. For a budding church musician, visiting a different church every evening for weeks on end was incredibly valuable, and getting to know host families was often extremely rewarding. Being on the other end of the choir tour spectrum gives me the privilege of providing this same opportunity for today’s students and hopefully making it smell a little better for them. On Monday, March 12 at 7:00 pm, the Schola Cantorum from Westminster Choir College in Princeton, NJ will give a concert here as part of their Spring tour. In addition to being my alma mater, Westminster is home to some of the finest choirs in the country so this should be a superb program. Hosting these student choirs is a wonderfully collaborative ministry for us to be involved in. We help provide an invaluable experience for the students and support them in their studies and in return they give us a beautiful musical experience which I hope you will all plan to attend. By getting further involved, we have the chance to get to know these students and share in their stories and they in ours. We are responsible for keeping the 70 Westminster students over Monday night so I hope many of you will consider signing up to give a group of students a comfortable bed for the night in your sweet smelling homes. I will be airing out the church basement and hope to provide this wonderful choir with a truly fragrant experience at Trinity Church. Sorry, I can’t do anything about the buses or roommates. Yes! I want to help host students from Westminster Choir College! How can I help? What are my next steps? We are so glad you asked those questions! How many students would you be willing to host? Would you prefer to house men or women? (Students are college sophomores). Do you have dogs or cats? (A few students have allergies). The date: Monday, March 12, pick up after concert and return to church the next morning having been fed breakfast. Details will be provided closer to concert time. Thank you in advance! What is it…worship or concert? The Anglican Office of Evensong, as established in the 1549 Book of Common Prayer, resulted from the fusing together of elements from the Roman Offices of Vespers and Compline. Evensong, a liturgical pattern of psalms followed by lessons and canticles, always includes choral settings of the Magnificat, a hymn of praise expressing the joy and thanksgiving of The Virgin Mary following her Annunciation; and the Song of Simeon, a salutation of God’s promise of salvation as found in The New Testament. In addition to the singing of the established psalms and canticles, hymns and anthems are normally included in Evensong services today. “Evensong comes from a time when the arts were understood as a gift from God, meant to lead people into a deeper understanding and love of God. We moderns perceive a distinction between worship and performance that would not be audible to Evensong’s first hearers; for them, to listen to sacred music was itself an act of meditative devotion. Can you adjust your ears accordingly? Evensong was peace and solace. These people worked hard. From Water-Pic to John Deere, the machines that make our life easier were missing. Evensong at the end of the workday must have been a blessed rest to them. They didn’t have our expectation that the whole congregation should participate in the liturgy, sitting quietly for half an hour or so felt good. Can you put aside your labors and be at rest with Evensong? Evensong was delight. Sixteenth century Anglicans did not own CD players— understandably, since electricity had not yet been domesticated. They did not have the option of staying home and listening to sacred music in their own cottage, or even watching 60 Minutes. Evensong was an experience of special, extraordinary richness, a musical message about a beautiful, orderly transcendent reality that underlies the human experience of risk, pain, and need. Can you, through sacred rest, encounter this beauty and order? How many times did my mother tell me “no dessert until you eat your vegetables,” or “no television until you finish your homework”? This is how it often seems in the church during December. “No Christmas Carols until after Advent.” It’s understandable that it sometimes feels unreasonable. After all, the other kids get to do it. Christmas carols are everywhere starting right after Thanksgiving; on the radio and TV, at the mall and grocery store, in the elevator, and even in many non-liturgical churches. We are swamped with Christmas the very minute we stop buying turkeys. But, just because the other kids are doing it doesn’t mean we have to also. The Anglican Communion is a liturgical church. This means, in part, that we follow a prescribed liturgy in our daily worship and a yearly lectionary which determines the readings for each service in conjunction with the liturgical seasons. The first of these seasons is Advent. In following the lectionary, we observe Advent for the four Sundays leading up to Christmas and wait until the eve of the blessed day to recognize Christmas in all aspects of our worship. This is the case in all liturgical traditions including the Roman Catholic, Eastern Orthodox, and Lutheran churches. Like most kids, I didn’t like being told to eat my vegetables, but it was mostly because I didn’t understand. As I got older, I began to appreciate delayed gratification. I saw the truth in the axiom that good things come to those who wait, and that dessert is even sweeter when we have anticipated it for a while. One of the things about Advent is that it makes Christmas all the more special. However, there is much more to it than that. After many years of having them both prescribed, I find that in addition to being good for me, I actually like Advent and vegetables. Advent is not just a time to wait for Christmas. It is a time to “Prepare the way of the Lord, make his paths straight”. Advent is the season of John the Baptist, the angel Gabriel visiting Mary, of Gregorian chant and Handel’s “Messiah”. It is a season filled with inspiring imagery and symbols of darkness and light. It is like those magical moments just before dawn. Take time to appreciate the unique beauty of Advent. Jesus will be here soon. Until then, look both ways before you cross the street, brush your teeth before bed, and never run with scissors in your hand. Excerpts from Handel’s “Messiah” with strings and tenor soloist Michael Forest. Service of Lessons and Carols with the Mastersingers of Virginia. Featuring “Ceremony of Carols” by Benjamin Britten. Concerti for Strings by Arcangelo Corelli including Christmas Concerto to benefit hurricane victims through The Episcopal Relief and Development Fund. Once upon a time there were ten virgins (yes, it was a long time ago). Five of them were wise and five were foolish. When they went to meet the bridegroom for the big wedding banquet, the wise virgins took flasks of oil to refill their lamps. The foolish did not. When the bridegroom was delayed the ten virgins fell asleep waiting. At midnight there came a shout that the bridegroom was on his way so they awoke in the dark and trimmed their lamps at which point the foolish asked the wise for some of their extra oil. The wise said no and sent them off to the Palestinian Southern States to get more. While they were gone, the bridegroom ar-rived and took the five wise virgins to the wedding banquet while the foolish ones missed out. And so it is with the coming of the Kingdom of God. Wake up and be ready or you will miss out. This famous parable, another eschatological allegory, is appointed for one of the last Sundays in year A of the three year lectionary and this year falls on Sunday Nov. 12. Our music that morning will follow this theme using the great German hymn “Wachet Auf” (Sleepers Wake). Often called “the King of Chorales”, both words and hymntune were written by the German pastor Philipp Nicolai around 1597 in Unna, Westphalia using the parable of the wise and foolish virgins as its foundation. More than a hundred years later, the ever energetic J.S. Bach, who wrote sacred cantatas for every Sunday of the three year lectionary and then some, composed his cantata 140 for the 27th Sunday after the Trinity using the Wachet Auf Chorale as its theme. It is Bach’s harmonization of the tune that we will sing from our hymnal and the choir will sing a movement from the cantata at the Offertory. In a somewhat more indirect reference to this theme, the Handbell Choir will play during communion a piece based on Westminster Quarters which is the tune clocks play indicating it is time to Wachet Auf (Wake Up)! It should also be noted that reading the parable of the wise and foolish virgins in church does not hap-pen very often. This parable is only in Matthew and only in year A of the lectionary which means it on-ly comes up every three years at best. Further, the 27th Sunday after the Trinity does not happen eve-ry year A, but only when Easter comes early enough to allow that many Sundays after Trinity Sunday which moves with Easter. It is believed that Bach performed his Wachet Auf Cantata only once, in part because of how rarely the appointed Sunday comes up. And yet, Bach composed what many musicians and scholars believe is one of his finest cantatas for this infrequent occasion. I like to think it is because this famously devout musician well understood the lesson of this special parable that is applicable to so many parts of our lives. From the Boy Scout motto to birth control to the coming of the Kingdom of God: always be prepared, for you never know when the time will come. Don’t be caught sleeping. Wachet Auf!